Lean and satisfying pork tenderloin is always sophisticated, especially when topped with a sweet and tangy wine sauce, and served with a harvest-inspired purée. 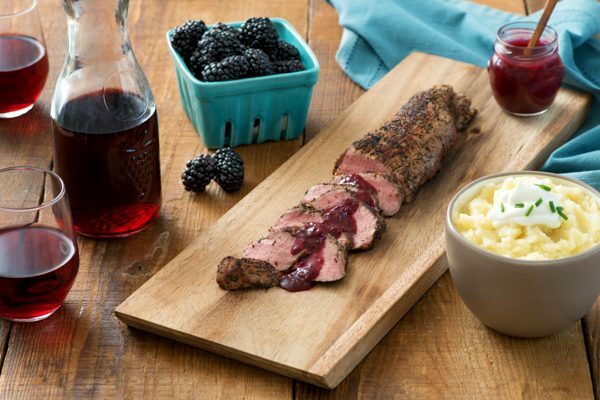 Make this Pork Tenderloin with Apple Parsnip Purée and Blackberry Wine Sauce to elevate your dinner to a new level of elegance to wow your guests. In large saucepan, combine apples and parsnips; add generous pinch of salt and pour in enough cold water to cover. Bring to boil over high heat; reduce heat and boil gently for 25 minutes or until parsnips are very tender. Drain well. Pulse in food processor with salt until very smooth; cover and keep warm. Preheat oven to 400°F (200°C). Remove silvery membrane from pork tenderloins. Toss together thyme, salt, pepper and cinnamon; rub all over pork tenderloins. In large skillet, heat oil over medium-high heat; cook pork tenderloins for 2 to 3 minutes per side or until well browned. Transfer pork tenderloins to foil-lined baking sheet; bake for 20 minutes or until instant-read thermometer registers 160°F (71°C) when inserted into thickest portion of largest tenderloin. Transfer to carving board and tent with foil (internal temperature should rise to 165°F/74°C). Slice diagonally into 1/2-inch (1 cm) thick pieces. Meanwhile, in same skillet, cook shallot and garlic over medium heat for 2 minutes or until softened but not browned. Pour in wine; simmer for 2 minutes or until slightly reduced. Add blackberries, broth, apple juice, vinegar, honey, thyme, salt and pepper. Simmer for 5 minutes or until berries are tender. Whisk cornstarch with 1 tbsp (15 mL) water; stir into sauce. Cook, stirring constantly, for 3 minutes or until thick and glossy. Remove from heat and slowly stir in butter, one piece at a time, making sure previous piece is completely incorporated before adding the next one. Spoon some Apple Parsnip Purée in centre of 6 dinner plates; fan slices of pork along one side of purée and top with spoonful of Blackberry Wine Sauce, serving remaining sauce on the side. - Serve with wilted spinach, kale or Swiss chard. - For a smooth blackberry sauce, purée in a blender, food processor or use an immersion blender.